Ronald Reagan's fierce protector was there to the end. Nancy Reagan was at the Gipper's side for a half-century in his journey from motion pictures and head of the Screen Actors Guild to California governor and president of the United States. He called her Mommy. She called him Ronnie. She was also there as caregiver when Alzheimer's disease sapped his memory in the sunset of his life at the couple's Bel-Air home. The nation's 40th chief executive knew it would be tough on the light of his life. "I only wish there was some way I could spare Nancy from this painful experience," Reagan wrote in his poignant November 1994 letter to the American people disclosing he was diagnosed with Alzheimer's. When asked about the president during those declining years, Mrs. Reagan seemed to force a smile before saying simply, "He's OK." There were no details, no elaboration. "You know that it's a progressive disease and that there's no place to go but down, no light at the end of the tunnel," she wrote in the book "I Love You, Ronnie," a collection of letters he wrote to her, published in 2000. "You get tired and frustrated, because you have no control and you feel helpless." Yet Reagan's protector was always on the job. When he fell and broke his hip in January 2001, she was with him at the hospital night and day. "I think the only time that they were able to get me out was they wouldn't let me in the operating room. But otherwise, I was there," she said. Throughout their years together, Mrs. Reagan was her husband's champion, helpmate and closest adviser. Admirers and detractors alike insisted Nancy was the real power in the White House. "This morning I had planned to clear up the U.S.-Soviet differences on intermediate-range missiles but then I decided to clear out Ronnie's sock drawer instead," she once joked with an audience. "I make no apologies for telling him what I thought," the former first lady wrote in her 1989 book, "My Turn: The Memoirs of Nancy Reagan." "For eight years, I was sleeping with the president, and if that doesn't give you special access, I don't know what does! So yes, I gave Ronnie my best advice whenever he asked for it, and sometimes when he didn't." While working as an actress at MGM, she met Reagan in 1950 through an old family friend, director Mervyn LeRoy. She had gone with him with a problem — her name had been placed in an advertisement in a list of people she considered left wing. LeRoy called Reagan, the president of the Screen Actors Guild, who discovered Nancy's name had been put in the ad by mistake. They discussed it over dinner and were married two years later, on March 4, 1952. It was her first marriage, his second. Patti was born in October and Ron six years later. Reagan had two children from his previous marriage to actress Jane Wyman, Maureen and Mike. She and Reagan made one movie together, a 1957 World War II story called "Hellcats of the Navy." 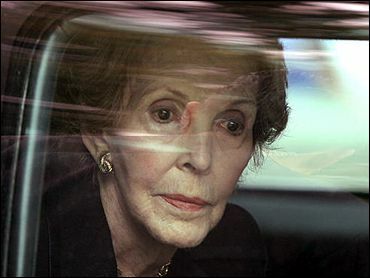 During Reagan's final years, Mrs. Reagan and a nurse cared for him with a contingent of Secret Service agents nearby. First quietly, later publicly, she lobbied for funding for stem cell research, which could some day help fight Alzheimer's, even though many abortion opponents are against it. "Ronnie's long journey has finally taken him to a distant place where I can no longer reach him," she said at a fund-raiser in May. "Because of this, I'm determined to do whatever I can to save other families from this pain. I just don't see how we can turn our backs on this." She ventured frequently to the Ronald Reagan Presidential Library in Simi Valley, some 60 miles away, to autograph copies of her book or attend speeches and seminars. She was glamorous and gracious on those occasions. And she always forced that smile when asked about Ronnie. Once, pausing at a gallery of photos in a Century Plaza Hotel suite dedicated to Reagan, she smiled widely when she spotted a picture of them floating in their canoe Tru Luv in the pond the president built at their mountaintop ranch north of Santa Barbara. "I'm old-fashioned, I know, but I thought it would be so romantic if he was playing a ukulele," Mrs. Reagan said, recalling the photo taken on their 25th wedding anniversary. "I don't have a ukulele," Reagan told her that day. "We've had an extraordinary life ... but the other side of the coin is that it makes it harder," she wrote in "I Love You, Ronnie." "There are so many memories that I can no longer share, which makes it very difficult. When it comes right down to it, you're in it alone. Each day is different, and you get up, put one foot in front of the other, and go — and love; just love."